You don't see those every day. You picked the two USA Production Models that have rosewood boards. Very nice! i kept watching and hoping that they would make one with a rosewood and they did. Then the second one came out soon after and I had to get it also. 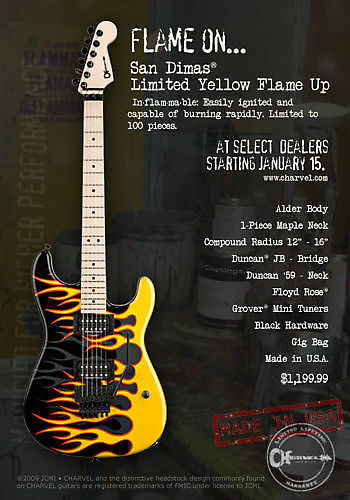 In posts 39 and 41 of this thread, there is a guitar called Yellow Flame. Here is the scan for it. Hadn't seen it until today. Just adding it to our thread here for completeness.